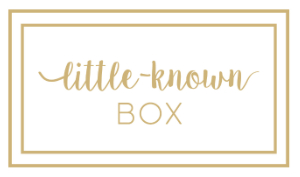 Little-Known Box is a trading name of HJ Manicure Ltd.
Email marketing (if applicable): With your permission, we may send you emails about our store, new products and other updates (such as Limited Edition boxes so that you don’t miss out on anything exciting!). To keep details of any transactions and purchases made through our site, and the fulfilment of any orders. To ask you to fill in surveys for research purposes – but you do not have to complete them. Our ecommerce is hosted on Crate Joy. They provide us with the online e-commerce platform that allows us to sell our products and services to you. Your data is stored through Crate Joy’s data storage, databases and the general application. If you choose a direct payment gateway to complete your purchase, then Crate Joy may store your credit card data. For more insight, you may also want to read Crate Joy’s Terms of Service here or Privacy Statement here . We may disclose your personal information to any member of our group. This means our subsidiaries, holding company and its subsidiaries, as defined in section 1159 of the UK Companies Act 2006. If HJ Manicure Limited or its assets are acquired by a third party, personal data held about it’s customers may be one of the transferred assets. To protect your personal information, we take reasonable precautions and follow industry best practices to make sure it is not inappropriately lost, misused, accessed, disclosed, altered or destroyed. If you provide us with your credit card information, the information is encrypted. Please read Crate Joy’s or the payment providers Terms & Conditions for more information regarding payment security. Although no method of transmission over the Internet or electronic storage is 100% secure, we use payment systems as offered through Crate Joy that follow all requirements and implement additional generally accepted industry standards.